Eva Lendel 2017 wedding dresses collection is a combination of the most modern and daring trends in bridal gowns. Looking through the new “Santorini” collection you will find a great selection of romantic ball gowns and body hugging silhouettes, with some creative and unconventional details. These trendy deep V-necklines, illusion flutter sleeves and absolutely gorgeous overskirts from the latest 2017 collection are already available at select stores worldwide! Elegant Cameron features a stunning off-the-shoulder A-line silhouette. Perry is a chic ball gown with lace embellishments on the bodice and skirt. Amazing 3-dimensional floral appliques reign on the bodice of Holly gown. Fashion forward detailing with the elegant style of Britany. Romantic mermaid dress Bler deep V-neckline with crystal beaded shoulder details. Brooke, a soft a-line silhouette, trendy v-neckline, is perfect for the modern romantic bride. 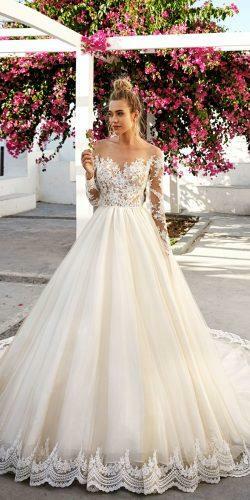 Lace sheath gowns with a tulle overskirt, touch of romance with Tailor. 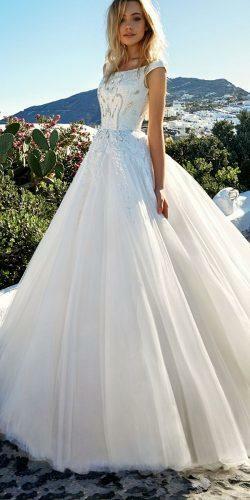 Maya, overskirt option, embellished bodice and eye-catching illusion back. Supremely elegant Tina beaded lace wedding dresses. Paige is a pretty long sleeve ball gown, from Eva Lendel’s 2017 bridal collection Eye-catching A-line skirt with lace short sleeves of Sidny. Allen features a gorgeous long sleeve ball gown skirt for a classic bride! Ultra-modern Kate illusion neckline gown appliqued 3 dimensional flowers in blush. White features a graceful half sleeve bodice that’s accented bya-line skirt! Talia is a whimsical sleeveless ball gown accented by lace. The contemporary design of Thaiya wedding dress with crystal beaded bodice looks elegant and exquisite. Princess ball gown with elegant beaded bodice, meets exquisite in Prue. Impressed? We sure are. Are you considering Eva Lendel wedding dress now? These gorgeous gowns are available at select stores worldwide in a wide range of styles. Discover even more magnificent creations at evalendel.com!